Attacks against homeopathy: what are its opponents afraid of? The patient is like a customer. And customers get irritated pretty quickly with suppliers or providers who don’t play the ball down the middle. The ongoing virulent, constant attacks launched on homeopathy in the Western world are leaving us, as patients, particu larly perplexed. But what exactly is making the opponents of homeopathy so afraid? Why this aggressive behaviour against an alternative medicine that offers so much satisfaction to patients? Explain it to us, if you can. Don’t expect this article to come up with systematic counter-arguments to fend off the criticisms put forward at every turn by the enemies of homeopathy. Patients, whom some would call gullible, have more faith in their own experience with homeopathy than in so-called scientific explanations supported by unverifiable statistics. Patients know where their interests lie. Patients make comparisons; that’s all there is to it. And they remember what works for them. And usu- ally they couldn’t care less about the why and how of it. Let’s face it: today’s customers/patients are fickle. If conventional medicine no longer suits them, they turn their back on it. They’re sick to the back teeth with side-effects, condescending doctors and 6-minute consultations conducted with one eye on the clock. And complementary or alternative medicines – of which homeopathy is one – had better be on their toes as well. Because if patients don’t think the alternatives work, they’ll drop them, too. Just like that. After all, it’s their God-given freedom. Let us just say to everyone involved in the healthcare sector: the customer/patient/citizen is always right, even when he’s wrong. It’s up to the professionals to adjust to market demand, not the other way round. They’re the ones working on behalf of the patient, who pays their salary! Which is why doctors owe him respect. People can be naive and trusting; but even the most convincing cons can only last for so long. Which is just as well. But homeopathy… to the utter rage and despair of its fiercest detractors, this monumental scientific absurdity, dreamed up two hundred years ago by an obscure German doctor, continues to attract more and more followers – and that’s despite two centuries of increasingly vitriolic attacks. So why is it that homeopathy patients ignore the vituperations of scientists and the pharmaceutical industry alike? The answer is entirely simple: patients realise that homeopathy works for them. And it has bugger all to do with the spoutings of doubters explaining where they are going wrong. In the meantime, the patients feel better. Much better. Homeopathy works. Frequently. Not always. And thank heavens it’s not always. Because the fact that homeopathy is not infallible helps fuel new ener- gy, new research, boosting its commitment and desire to surpass itself. And it’s good to know that the homeopath is willing to take his or her time to think with patients, to help them put their symptoms into perspective, no matter how overwhelming they may seem. Because that particular ‘quack’ doesn’t simply prescribe a tablet, like a silver bullet that makes it all better. No, he or she tries to understand patients, find out how they function, delve into what the specific features are that may have nothing to do with the reason they sought help in the first place. This doctor operates using empathy, whether openly or discreetly. He or she takes a holistic approach to patients – and does not just see them as a body with a defective organ or two. When’s a placebo not a placebo? So, yes, there is an emotional dimension. There is a subjective side to homeopathy and sometimes the process does involve a placebo. Exactly as it does in conventional medicine, for that matter. To deny it would be lying. But homeopathic practitioners and their patients are convinced that there is something else happening – despite the detractors who shout themselves hoarse to declaim left, right and centre that there is ab-sol-utely nothing that works in a homeopathic remedy. Rationally, they are right. By linking dilutions there cannot, logically, be the slightest molecule of the active ingredient left in the remedy. Which was what the Dynhom Belgian fundamental research project sought to verify, with its high dilutions from two very different remedies: copper (a simple chemical element) and Gelsemium, a plant with all its organic complexity. The team was able to use very high-tech resources made available by Belgian, French and Italian universities. And the result? Yes, in the face of all logic, these dilutions did contain clearly visible particles. Impossible… and yet there they were! Other studies have shown that homeopathic remedies work in particular by modulating the expression of some of our genes (stronger, less strong, but without modifying them). This biological action can be identified today by conventional molecular biology technologies. There is scientific proof to show that homeopathy works; but a large proportion of the scientific com- munity refuses to accept it – or says it is not very convincing. And they wheel out the case of a child who died in Italy from an otitis-related complication after receiving homeopathic treatment. That, in- deed, was a terrible event. One that was covered by the media in many countries. But there was not a word about the hundreds of thousands of deaths all over the world caused by the toxic effects of con- ventional medicines, not to mention the countless deaths caused by medical error. In France, the member of parliament, Roland Muzeau, estimates that there are 150 000 admissions to hospital every year caused by medical drug-related accidents – and that there are between 13 000 and 18 000 deaths caused by medication. These figures come from the report submitted by the French National Assembly’s commission on social affairs at the conclusion of the work conducted into the Mediator and pharmacovigilance. On the Indian sub-continent, the State provides equal support for conventional medicine, homeopathy and Ayurvedic medicine. The world’s largest democracy allows itself to be influenced far less by the economic and financial considerations that govern the West. Faced with the health needs of a popula- tion in excess of 1.35 billion, the Indian State does not concern itself with the greed of the industry. And what is the result? The least that can be said is that the efficacy of these three different medicines is remarkably comparable when taken over a population whose size is… statistically representative. The only difference is that there are no or few side-effects with either homeopathy or Ayurvedic medicine. What would happen if we stopped treating patients as though they were stupid? That our freedom and choice of treatment be respected. When part of the huge healthcare sector constantly and systematically attacks other components and disciplines in the same sector, it is trying to influence the patient and degrade the honour of the other parties involved. That all forms of condescension, finger-pointing and threats cease in terms of patients who intend to exercise their right to be free to take the treatment they want. Patients’ right to disa- gree is also a manifestation of their dignity. That there be respect for the concept of complementary medicine. Much more than just being alternatives (which really they are not), the various forms of non-conventional medicine are the perfect complement to so-called conventional medicine. Each one is capable of achieving results that the others are unable to produce – or at least with difficulty. And it would be very bad faith indeed to claim that the complementary medicine disciplines somehow overshadow or present unfair competition to conventional medicine. Patients tend to have the impression that these pressures work in the opposite direction. That it be accepted that medicine is not an exact science. Complementary medicines often owe their efficacy to taking account of parameters that depart from today’s die-hard scientific rig- our. But what science understands, quantifies and masters is very little compared with the ineffable complexity of the living person and the manifestations of their intelligence. For clinical trials to be independent. The ‘Clinical trials with and for the patient’ symposium organised on 26th September 2017 by the Belgian Federal Agency for Medicines and Health Products (FAMHP) clearly stated that, today, only 20% of clinical trials are independent. This means that 80% of them see their scientific process guided by pharmaceutical companies with the intention of ending up with a pre-established marketing objective. Where is ‘putting the patient first’ in that? And what about scientific rigour? And should we see a cause-and-effect relationship with the staggering mortality statistics due to medical drugs? What is written here is based on the experience of patients, on what they are saying. Any observations are empirical, governed by common sense and the notion of criticism that lives with people. No doubt it would be possible to provide a whole host of ‘scientific’ statistics contradicting what has just been stated. In which case it would also be possible to find other statistics that reinforce the point of view of patients. These debates serve no real purpose and merely deplete our energy. Refusing to accept different approaches is hardly a sign of open-mindedness. Denying the specific methodological features of complementary medicine will always make it possible to demonstrate ‘scientifically’ the lack of fundamentals for these disciplines, despite their countless successes and their acceptance by patients. It is worthwhile saying at this stage that any scientific process should include inquisitiveness – i.e. being open to the unknown and the unexplored. What reassures us, as patients, is this slogan that everyone agrees on: putting the patient first. Brilliant. And what would happen if everyone put this credo into effect, here, right now? If they stopped fobbing us off with ‘evidence-based’ instead of ‘human-based’? 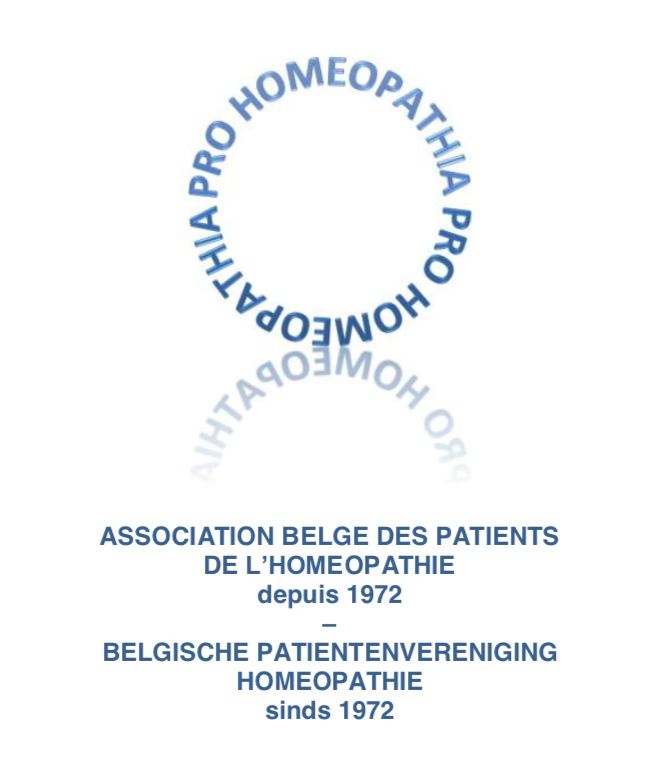 Pro Homeopathia, the Belgian association of homeopathy patients, since 1972.